Learn more miscellaneous Flockmod features. You may change these settings to your liking, they will only affect your client. Quality: Click the dropdown menu to toggle between low and high quality to reduce the quality of wording and outlines. Show own username next to cursor: Unchecking this will make your username disappear on the board; others can still see it. Enable smoothing: Smooths lines by softening the edges. Uncheck to see sharp pixels. Show User Events: Having this checked will notify when a user enter and leaves the room in the chat. If you are a moderator with the correct privileges you will see user’s IP addresses next to their name when they enter and leave. Show Timestamps: This will give the time a chat message was posted, in 24 hour clock. This time is dependent on your computer’s set time. Show Global Messages: Having this checked will allow you to see the messages Global Mods have sent out for every user. Automatically remove old messages: This will remove old chat messages as more come, this is useful if having many chat messages lag you. Enable sounds: Unchecking this will mute all sounds from Flockmod. Chat message tone: Play a distinct sound when someone types a message in chat. Private message tone: Play a distinct sound when someone private messages you. Inbox message tone: Play a distinct sound when you receive an inbox message. Moderator message tone: Play a distinct sound when someone sends a moderator message. You must have the correct privilege to see this option. Each checked option here will load upon selecting a preset. Learn more about presets here. Enable Advance Save: With this option enabled you can save a portion of the board rather than the full board. You may choose between lasso and box selection methods. Save to the online gallery: When this is checked, any saves that are made are uploaded directly to the online Flockmod gallery. If you have an account there it will be uploaded under your name. 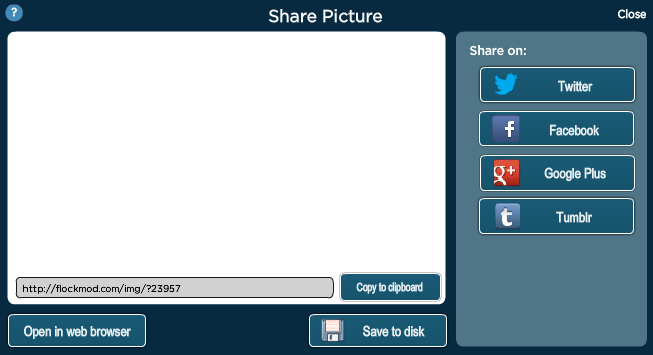 The Share Picture panel will appear after saving the board while this option is selected, allowing you to save to your computer or to social media. It also provides a shortlink to your saved image. Auto-switch Eyedropper: Having this checked will send your tool back to the previous tool after using the eyedropper. 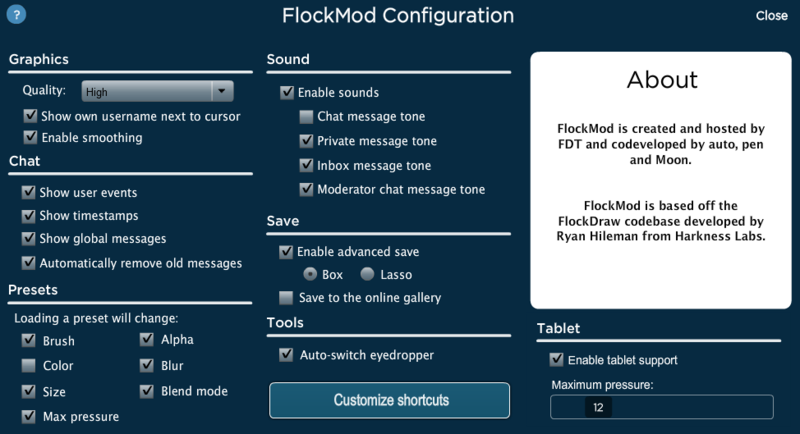 Enable tablet Support: Flockmod has pen pressure support for tablet users who use the desktop app. Your size will go up according to the pressure you put down. To avoid mistakes you can limit your size with the slider in the config or on the bottom bar. Once your tablet is detected a message will appear notifying you of it, and it will ask you to press down all the way to range your pressure. Read about those who helped create Flockmod. 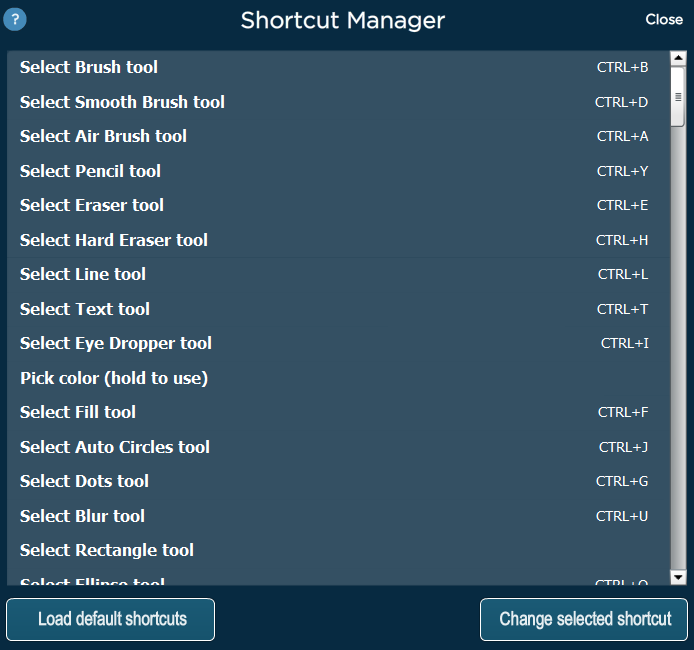 The Shortcut Manager is located in the configuration menu, or in the “…” panel. It offers over 150+ customizable keyboard shortcuts. You can view your current shortcuts or assign your own. There are many different uses for shortcuts, more than just the brushes, browsing through them may help improve your experience.